Note:- 123456 is the item ID of the particular item. This can be found in the base table of the item (MTL_SYSTEM_ITEMS_B). SEGMENT1 column of this table would have Item Name and Inventory_item_id is the primary column of the table. The follow query is using this value. 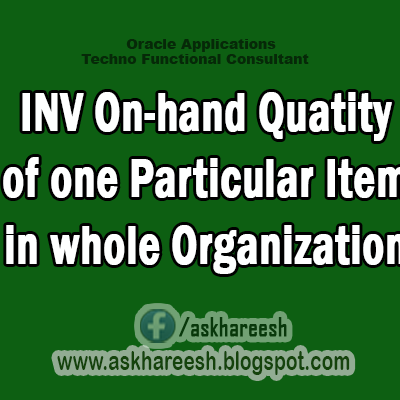 If you want to know the on-hand Quantity of particular item at all the Inventory Organization then use the following the Query.